FREEPORT, Texas – It’s the catch of a lifetime, but it’s not clear whether a Texas fisherman landed an 8-foot shark or it landed him. The mako shark had apparently been in a rush to feed. It began thrashing around, and Kresse said he and his crew couldn’t get close to the 375-pound fish to toss it back in the water. It damaged the boat before dying several hours later. “We had to use a forklift to get it off the boat when we got to the dock,” Kresse said. 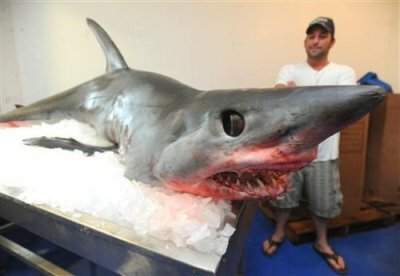 The crew didn’t have a permit to catch sharks, so Kresse contacted federal fisheries officials on shore to get one. Mike Cox, a spokesman with the Texas Parks and Wildlife Department, said there’s no violation because the shark’s death was an accident. The original and complete article can be found here.